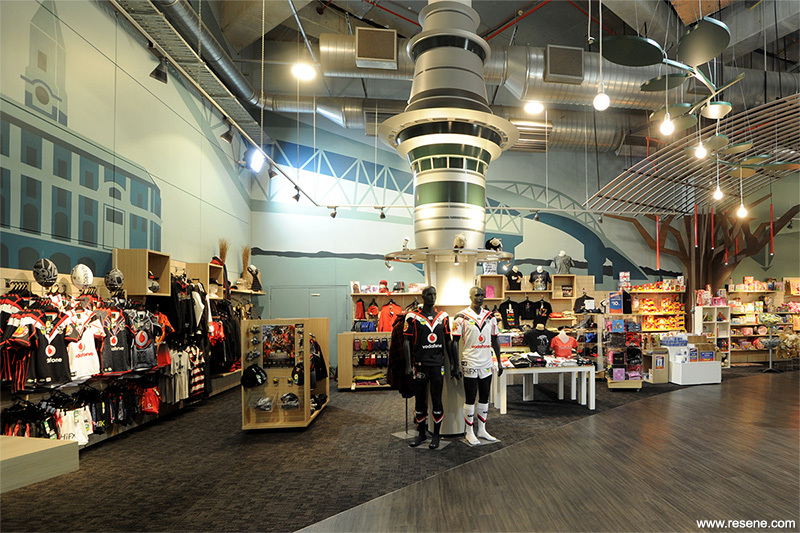 The existing Sky Tower retail store needed an upgrade to incorporate a 'Disneyesque' style fit-out showcasing a flavour of the Sky Tower offering and reflecting its role as the entry point for ascending the Sky Tower to its viewing platform. The site had a huge array of different fixtures and design elements within the space; it lacked direction and did not instil the necessary excitement before going up one of Auckland’s iconic scenic experiences. 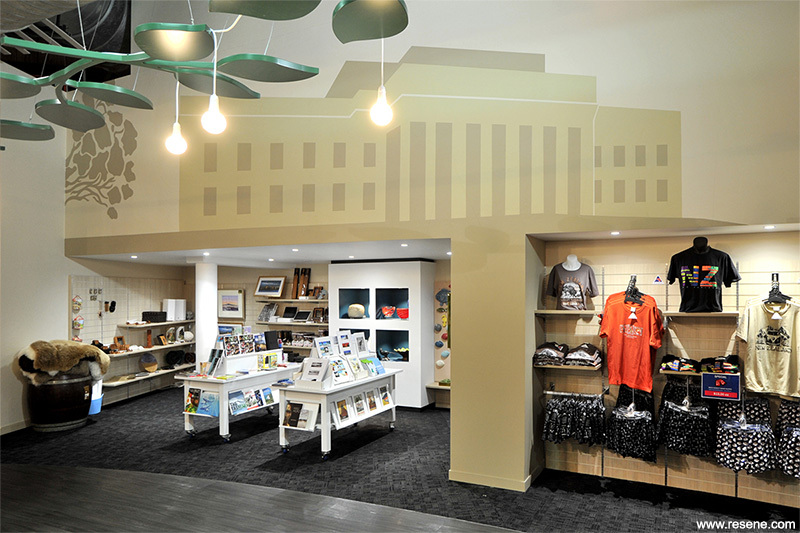 Drawing on the graphical element that is characteristic of Disney stores, the design focuses on other key iconic Auckland landmarks presented as simple silhouette graphics, creating a backdrop to the merchandising below. These graphics tell a story, local to the Auckland landscape; a prelude to the sights they will view when up the tower. 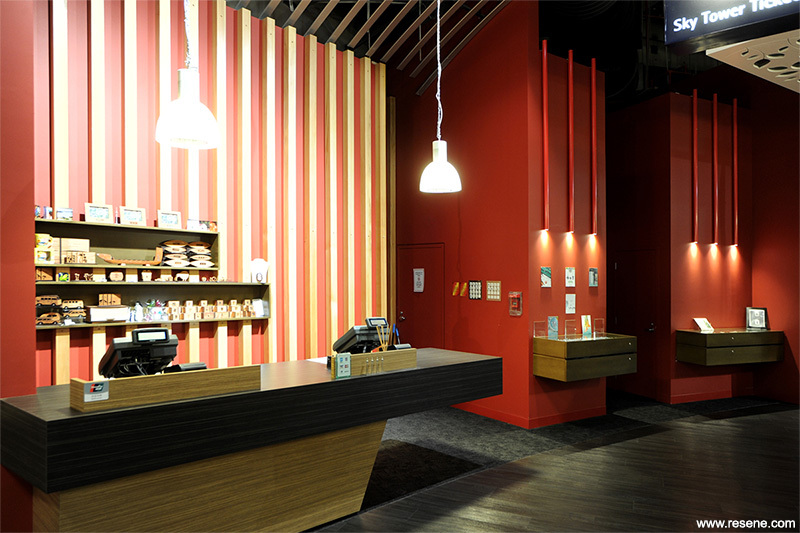 The main objective in any retail store is to sell product, the design must be the backdrop to provide ambience and atmosphere to the main objective. Keeping these icons as simple silhouette graphics, hand painted 'old school' style instead of intricate photographic reproductions, creates visual interest to the vast height of the perimeter walls without detracting or drawing too much attention away from the products on display below. Finishes, colours and design treatments throughout the space were selected to reflect the natural scenery we are famous for and also to complement some of the building's existing features and natural timbers. Varying shades of blues and greens were chosen - Resene Sorrento (blue green), Resene Deep South (teal blue), Resene Undercover (juniper green), Resene Teal Blue (cool blue), Resene Warrior (deep dusk green), Resene Envy (watery green), Resene Gondwana (landscape green) and Resene English Holly (deep green) all selected as representative colours for our forests and lakes. Added to this were warm beiges – Resene Half Sisal (soft beige), Resene Pavlova (strong neutral cream) and Resene Triple Sisal (greened ochre) – denoting our golden sand beaches. Hints of rich red inspired by the Pohutukawa tree, our best known coastal native, is achieved through the bold shade of Resene Dynamite (blue red), used to demarcate the sales counter zones, creating a strong visual presence from anywhere within the store. The perimeter walls are treated with the hand painted silhouette graphics of iconic Auckland landmarks to their full height. Previous interior treatments only reached 2.2 metres. Incorporating the entire expanse of the store, the full height treatment creates maximum visual impact of both colour and graphics within the space. Lowered branch like ceiling features along the central pathway in Resene Alabaster and Resene English Holly together with lower light levels emulate walking under a canopy of trees, delineating the path through the store. These features create a break within the space and are instrumental in bringing the ceiling down in scale. Large scale tree columns detailed in a simplified three dimensional manner signify the start of the journey at the storefront, and internally create a break in the length of retailing along the 'forest' path. Red painted piping, with internal LED lighting dropped between the branches is again suggestive of the Pohutukawa bloom creating additional connections to the use of red within the sales counter zones.